In all of the cultures that celebrate Christmas there is almost always one tradition that remains the same. Santa Claus is an almost universally known figure. His name and duties vary by location and culture but the idea behind him remains the same. He brings joy and hope to all those who believe in him or who want to believe in him. He stands as a symbol of all that is good in the world, he provides hope to those who need it, and the holiday brings families together. 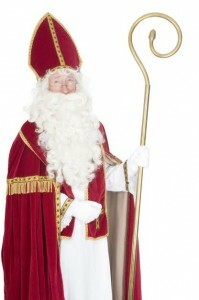 In Greece, St. Nicholas is the patron saint of sailors. He tries to help sinking ships before it is too late. When he is seen, he is said to be drenched in seawater and sweat because he fights the waves to protect sailors in need. Instead of reindeer pulling his sleigh, in most countries in Europe, Saint Nicholas/Sinterklaas rides a white horse when he delivers presents or chocolates. He is aided by Zwarte Piet (Dutch) or Père Fouettard (French). Saint Nicholas gives gifts on December 6 instead of December 25. This stretches the holiday season longer since most cultures celebrate until January 6, Epiphany. Every year, millions of children across the world send Santa Claus letters letting him know whether they were good or bad and what they wanted for Christmas. This is something that you yourself probably did when you were younger. What makes this task vary by country is how the Post Office responds to the onslaught of letters. Post Office workers in various countries process and sometimes even respond to the letters. 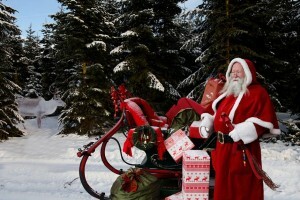 The Post Office Santa’s in France have been proven to be the busiest Santa’s in the world. In 2007, they received and answered over 1,220,000 letters sent from 126 countries! Did you know that Canada has a special postal code for letters to Santa? North Pole, Canada, h0h 0h0! In Britain, one way of sending a letter to Santa was by burning their letters in their fire places. Now British children send their letters in the regular post to Santa Claus, Reindeer Land, SAN TA1. Children in Latin American countries tie their letters to helium balloons and send them to Santa that way. If you send your Santa letter to: Santa Claus’ Main Post Office, Santa Claus Village, FIN-96930 Arctic Circle, you will be sending your letter to the Finnish Santa, Joulupukki. Both children and adults alike want to believe that there is someone out there spreading cheer all over the world at Christmastime. So tonight, while you get ready to head to bed, don’t forget to leave some cookies and milk for him and some carrots for his reindeer or horse! Buon Natale! ¡Feliz Navidad! Joyeux Noël! Merry Christmas! This entry was posted on Tuesday, December 24th, 2013	at 2:26 pm	. You can follow any responses to this entry through the RSS 2.0	feed. Both comments and pings are currently closed.